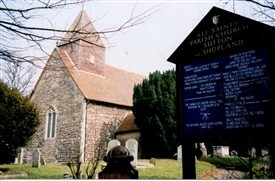 The parish church of Sutton was built mainly of stone and local ragstone in the 11th and early 12th century, probably by the monks from Prittlewell Priory. The floor brass and the window commemorating Phillip Benson the historian were removed from Shopland Church when that was demolished. That church had many interesting features including hatchments and a Royal Arms, a bell cast in 1638 by John Clifton, a manual organ, and a fine carved alms box. Perhaps its most important feature is the Monument to Chester Moor Hall who lived at Sutton Hall. His passion led to the invention of an efficient telescope. He used a double lens of two different types of glass and this gave us the present day telescopes, microscopes and cameras. On his memorial in the church he is referred to as an ‘able mathematician, inventor of the achromatic lens for the telescope.’ He is buried in the Sutton church yard. 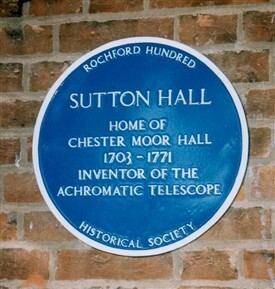 A blue plaque was placed on the wall of Sutton Hall in 2003. This page was added by Helen Barnard on 27/02/2012.